Onions are vegetables that belong to the lily family of plants. It is grown for its edible bulb, which most often serves to flavor a variety of foods. Onions are categorized as being either green or dry onions. Green onions are small onions that are harvested before the bulb has matured and the tops are still green. Dry onions, also known as mature onions, are harvested when their shoot has died and layers of papery thin skin cover a firm juicy flesh. There are two types of dry onions, fresh (Spring/Summer), which are also referred to as sweet onions and storage (Fall/Winter) onions. 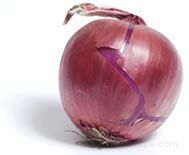 There are a wide variety of shapes and sizes, ranging from small round pearl onions to the larger spherical-shaped Spanish onions. Sweet onions have higher water content and are served either raw or cooked. Storage onions contain high sulfur content and less moisture, so they can be kept in storage for longer periods of time. The storage onion is used in cooking, providing a sharper and more flavorful taste than sweet onions. Green onions are small onions that have been harvested before they turn into mature onions. They may be of the same variety as dry onions but they are just picked at various early stages before the bulb starts to mature. Some are the young onions that are pulled to thin and make room for the mature dry onions to grow. Typically these onions have a white base and long, straight, green leaves, which both the base and leaves are edible. Green onions are used fresh in green salads, pasta salads, and potato salads, or cooked in dishes requiring a mild onion flavor. 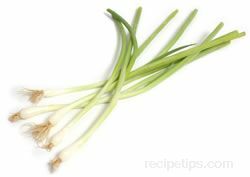 Although green onions are generally eaten raw, they can also be grilled, sautéed, or used in stir-fries. They can be chopped fine and used on baked potatoes or added to mashed potatoes. In most instances, both the white end and green tops of the green onions can be used. Varieties of green onions are available all year but their prime season is spring and summer. When selecting, choose those that have unblemished, firm white ends with fresh green tops. These onions are generally sold in bunches, which should contain onions that are fairly consistent in size. They should be clean and free of decay or insect damage. Store unwashed onions in a plastic bag with it wrapped around the onions and then placed in the vegetable drawer of the refrigerator. To help prevent the odor from spreading to other foods, wrap the onions in a paper towel before placing in the plastic bag. Store for up to 5 days. A young onion, which typically has a white base that has not developed into a bulb yet, and has long, straight, green tubular leaves. The small white end may vary slightly in size depending on what stage of development it is at when harvested. Generally the end will have a slight roundness to it. It is also commonly referred to as salad onions, spring onion, and scallions. Even though these terms are used interchangeably, there are some slight differences. A spring onion is a green onion that has been harvested during the early stages of growth but is a little further developed than the green onion. It is slightly larger and more rounded in shape and its flavor is slightly stronger. It is basically used in the same manner as a green onion but because of its stronger flavor, less may be used to prevent it from becoming overpowering. Even though the terms scallions and green onions are used interchangeably, they are actually two different onions. 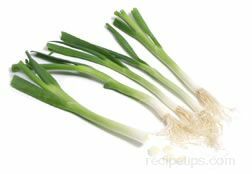 Green onions can actually be any variety of onion, whereas scallions are actually a specific variety. The bulb end of the scallion has straight sides and does not form a rounded bulb as other green onions may form. Scallions will generally have a milder flavor also. A perennial onion that grows in bunches. These onions generally do not form a bulbous base. They are first started by seed but then if left unharvested, they will die back during the winter and begin to grow again in the spring. They will then multiply and produce more onions year after year. As they multiply they form clumps or "bunches" of onions. The onions are harvested by pulling a small bunch of the more mature onions, being careful not to pull out the newer growth. As long as the entire clump is not harvested, the onions will continue to multiply. Sometimes only the leaves are cut from the onions. They will then grow another set of leaves. Bunching onions have a mild flavor, which makes them a good fresh eating onion, similar to green onions. They can also be used in the same manner as green onions when cooking or adding to salads. This type of onion may be referred to as Welsh onions and Japanese bunching onions. Fresh onions contain more moisture and are sweet and mild enough to be eaten raw. They are good when added to salads, hamburgers, and other sandwiches. They can also be used in dishes where they require light cooking. Sweet onions can also be grilled or roasted. Storage onions are good in dishes that require a longer cooking time or a more intense flavor. They are added to many dishes, such as casseroles, quiche, pasta sauces, soups, stews, and pizza. Their lower moisture content is beneficial when they are cooked by frying, sautéing, and baking. They can also be creamed or baked au gratin. Fresh onions are harvested and available from March to August. Because they do not store well, availability is more limited for fresh onions than storage onions. Storage onions are available throughout most of the year because of the length of time they can be stored but they are most plentiful from September through April. Choose onions that are firm and dry. The outer skin should have a shiny appearance and a dry crackly feel. 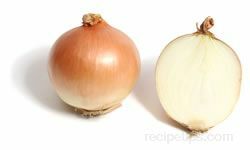 The onions should not show any signs of sprouting or have any soft spots, which are a sign of rotting. Dark patches on the onions may be a sign of mold. Avoid onions with green areas, which can have an off taste. The onion should have a mild odor. Any strong odor may be a sign of rotting. If purchasing onions that are sold in a bag, be sure to check all the onions for signs of rotting, sprouting or bad spots. Fresh onions can be stored in a dry, cool area that is well ventilated in the same manner as storage onions, but because of their high moisture content, they can only be stored for about half the time. Fresh onions can also be stored unwrapped in the crisper draw of the refrigerator. Place on a paper towel in a single layer on the bottom of the drawer and place the onions on the towels. Be sure to handle the fresh onions carefully because due to the high moisture content, they will bruise easily. Fresh onions can be stored for up to 4 weeks if stored properly. Storage onions should be stored in a dry, cool area out of the direct sunlight. The area should also have good air circulation. Do not store with potatoes because the potatoes will give off moisture and also an ethylene gas that will cause the onions to spoil faster. Do not store in a bag. 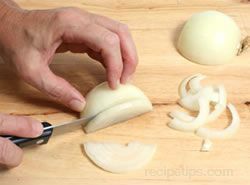 Place the onions in a single layer with enough room between each for proper air circulation. Under proper conditions storage onions can be stored for up to two months. All cut onions that have leftover portions can be wrapped tightly in plastic wrap and stored in the refrigerator for up to 5 days. 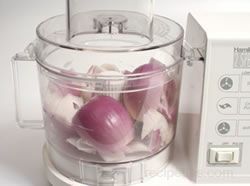 Store cooked onions in an airtight glass or plastic container. Do not store in a metal container because the metal can discolor the onions. Fresh onions are sweet onions that are harvested in the spring and early summer. They have thin, light colored skin and a sweeter, milder flavor than storage onions. 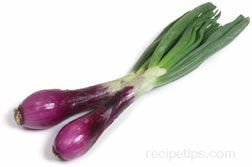 Their high water and sugar content and low level of sulfur compounds is what gives them their mild, sweet flavor, making them a good onion to use fresh in salads or to slice and add to hamburgers and other sandwiches. They are also good when lightly cooked. Because of their high water content and thin skins, sweet onions do not store well, limiting their season in comparison to storage onions. 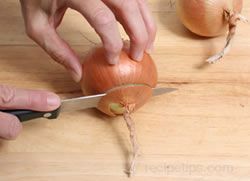 Sweet onions also bruise more easily that storage onions so must be handled more carefully. A fresh onion variety that is grown in Hawaii. It has a golden colored skin, sweet tasting flesh and generally weighs approximately 1/2 to 3/4 pounds. It often has a round flattened shape. It can be lightly cooked but is best when eaten raw. A true Maui Onion has been grown in the volcanic dirt on the upper area of Maui's famous dormant volcano. They are harvested by hand starting in May and running through November. They are then shipped mainly to the West Coast of the United States. A fresh onion variety that is grown in the foothills of the Andes Mountains in Chile, South America. They are the first sweet onion to appear in the markets. The OSO Sweets generally contain a higher level of sugar than the other sweet onion varieties. They have a crisp texture and very sweet flavor and hold their flavor, and texture better when cooked than the other sweet onion varieties. The OSO Sweet does not produce fumes when cut, making it a tearless onion. They are available January through March. Fresh sweet onions that are grown in southern Texas. SpringSweet is the name given to all sweet onions varieties that are shipped from March to June. 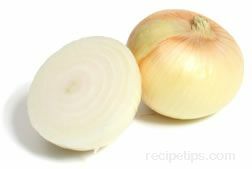 They contain only a small amount of sulfuric compounds, which cause tears when cutting onions. These onions are juicy with a mild sweet flavor. A variety of Texas SpringSweet onions. It was developed to be an even milder and juicier variety of the SpringSweet onions. It is a large onion, growing at times to over 4 inches in diameter and weigh a pound or more. These onions are available from mid-April through May. A globed shaped sweet onion cultivated in the California's Imperial Valley. This variety of sweet onion is at least 2 1/2 inches in diameter and has a longer shelf life than other sweet onions. It is available from late April through June. A popular variety of sweet onion that is nationally well known. It is named after a town in Georgia where it originated. To qualify as a Vidalia onion, the onion must be grown in a specified area of 20 counties, which is defined by Georgia state legislation, . Mildly sweet in flavor, the onion has a yellow to tan outer skin covering a white inner flesh. Vidalia onions are available from April to June but if stored under a controlled atmosphere, availability is extended up to 6 months. A type of dry onion that gets its name from Walla Walla County in Washington where it originated. It is a national rivalry to the Vidalia onion for being the most popular sweet onion. Walla Wallas are noted for their brown skins and white flesh, which has a very mild and sweet flavor. They are popular in salads or in other uncooked recipes because their flavor is best when eaten raw. Their shelf life is only 2 to 3 weeks after harvest. Walla Walla onions are available mid June to the end of August. Dry onions are harvested in the late summer through early fall. After they are harvested they go through a drying period known as curing. They are then stored and available throughout most of the year. They have lower water and sugar content than fresh onions, which, along with several layers of dark paper-like skin, allows them to be stored for long periods of time. 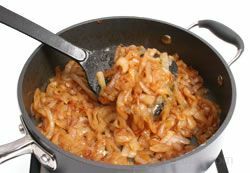 Their low water and sugar content also provides the onions with a more pungent flavor, which enhances the flavor of many savory dishes that require longer cooking times. Storage onions are available in white, yellow or red onions but the vast majority of onions harvested are yellow onions. A large, bulb-shaped, white, yellow or red colored dry onion that has a sweet, mild flavor. The name Bermuda onion originates from when the onions were first grown in the Bermuda Islands. They are now grown mostly in areas of the United States, such as Texas. Bermuda onion is a name used to refer to several different varieties of onions. Their flavor is sweeter during the peak of the season when first harvested than after they have been stored a while. It is excellent for salads, sandwiches, and cooking. It is just as versatile as the basic yellow onion, but it has a shorter shelf life. Bermuda onions are available throughout the year. 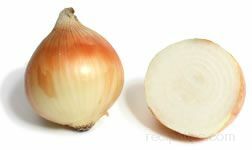 An immature type of onion that is generally white but it can also be a yellow or red onion. They are slightly larger than pearl onions, usually measuring approximately 1" to 1 1/2" in diameter, and are generally cooked whole. It is often used in dishes that are slowly cooked, such as stews and are a great addition to shish kabobs. Boiling onions are available throughout the year. A traditional Italian onion that has a flat oval shape. It ranges in size from 1 to 3 inches in diameter with a brown papery skin. As a member of the shallot family of plants, Cippoline onions are a dry onion harvested when they are mature, providing a flesh that is firm and juicy, with a delicately sweet flavor. This onion is used to season a wide variety of dishes from meat to soups, stews, and casseroles. This onion may also be referred to as a borettana onion. A mild, sweet flavored white, yellow or red skinned onion that has a crisp texture even after cooking. Pearl onions are actually immature onions of different varieties and are approximately 1 inch in diameter. The onions are planted very densely so that they cannot grow to be more than approximately an inch in diameter. They are most often available as a white onion. They are often roasted with meat, or added to soups, stews, and vegetable dishes. Pearl onions are available throughout the year. Pearl onions that have been preserved in vinegar. They can be added to casseroles and other dishes in place of regular onions or they can be eaten with cheese and meats as an appetizer. Smaller sized pickled onions, referred to as cocktail onions, are added to some cocktail drinks as a garnish. 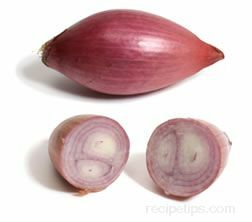 An onion variety that has purplish red skin and white rings of flesh that are outlined with purplish red. They are medium to large in size, have a mild, sweet flavor and a crisp texture. Red onions are good to eat raw and are used to add color to salads. 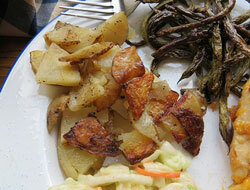 They can also be grilled or lightly cooked with other foods. One of the smallest varieties of the onion family. They are pear-shaped bulbs that grow in a cluster similar to garlic except they do not have an outer layer of skin holding the bulbs together. Instead the bulbs are attached at the roots. The shallot has a light cream-colored flesh that is lightly tinged with purple or green. The outer skin can range from rose to light gray to light brown. 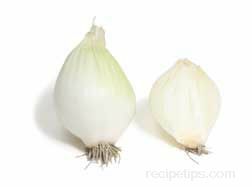 They have a mild flavor that is a cross between a sweet onion and garlic and is used to flavor meats, stews and soups. Shallots should not be browned because this causes them to become bitter. When used raw for salads and vinaigrettes, it provides a subtle yet distinct flavor not equaled by an onion. Grating a shallot instead of mincing or finely dicing, allows a greater amount of the essence to be released into the food while requiring only half of the amount of minced shallot required for a recipe. Shallots are available throughout the year. A large round dry onion that has a light golden caramel colored skin. The Spanish onion is the variety that is most often found in the grocery stores. It is the largest, most popular onion for slicing and eating raw because of its mild sweet taste. They can also be added raw to salads, baked, sautéed, or fried and they store well. Spanish onions make good onion rings. A globe shaped onion that has white flesh and white skin, which sometimes has a tinge of green. It has a clean, sharp flavor but is not as pungent as the yellow onion. Its flavor is also slightly sweeter than the yellow onion because of its higher moisture content. 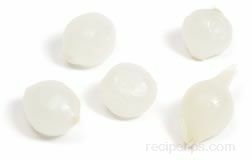 White onions have a firmer texture than yellow onions. It is eaten raw, generally on a burger or in a salad but it is better in heated dishes, such as casseroles, stews, soups and meat dishes. This onion is widely used in Mexican foods, complementing the flavors of other ingredients. It can be sautéed to a golden brown color and served as a side dish or used to provide a sweet delicate flavor to other foods. White onions can often be substituted with yellow onions in many recipes. Because of their higher water content, they mold easier than yellow onions so they must be stored where there is good air circulation. White onions are available throughout the year. A globe shaped dry onion that is an all-purpose onion. It is most commonly used when a recipe for a cooked dish calls for onions. It is more pungent than a white onion and has a golden brown, papery skin. Of all onion varieties, 80% of production is devoted to the yellow onion. Their high sulfur content makes them too pungent for most people to eat raw and the sulfur is also what creates tears when chopping. It provides a rich onion taste, making it a good choice for heated dishes requiring a distinctive onion flavor. When sautéed, they will turn a deep dark brown color and can be added as a complement to a variety of food dishes or meats. Yellow onions are used in casseroles, savory pies, quiches, stir-fries, pizzas, and soups, such as French onion. They are also a good onion for caramelizing. Yellow onions are readily available throughout the year.